High Rollers LIVE at TwitchCon Europe 2019! Joined by special guests Elspeth Eastman and DCA's Nate Sharp, get ready for a high seas adventure in The Curse of Captain Darkfinn! The team have found a chained spectre in the Night Eye they're not sure they can trust! Thanks to our one-time sponsor (and good friend) Brian McClellan! Grab his newest book - Uncanny Collateral - here: http://bit.ly/uncannycollateralhighrollerspodcast. Use the code HRDND for 10% off the Hardcover or HRDNDE for 25% off the e-book. That's just $3! Another floor to the Night Eye brings further puzzles and traps for the adventurers to overcome! Plenty of treasure to be found in the Night Eye Ruins... Also monsters! The party must learn how to swim as they head deeper into the ruins! The battle continues as the party continue their journey to the undead ruins! Fulfilling their end of the bargain, the team head out to solve an undead problem nearby! The team get some well deserved rest and gather some important new info! The party's journey has been interrupted by a few very hungry Ankhegs! After encountering some of the locals of this new land the party get to know their new ally! Still reeling from the events of the last episode the party are desperate for any help in this dangerous new land! After a devastating fight the party have been discovered again... I think it's time to run! In the belly of the beast the team are against some pretty powerful priests! The infiltration of the Abbey is going well so far... but for how long? The team gain an unexpected ally and begin their infiltration of the Abbey! Armed with a lot more information the party have decided they need an adult! The team made a difficult decision in the last episode, let's see if it all pays off! We now know what Breeze needs for his ritual, can we finally save the fading Tracker? Thanks to our new sponsor Elderwood Academy! Head to http://bit.ly/highrollerselderwoodacademy and, in the order notes, enter "Happy Birthday High Rollers" to get a free set of miniature metal dice worth $25! It's time for Sentry to meet the life-extending Guardian, Breeze! The gang have some time to kill, so Quill and Lucius compete in their preliminary Spell Clash battles! Sentry has a meeting with the Guardians and prepares a meet up with the illusive Breeze! Fire in the temple! The battle rages on, will the team survive Palador's cleansing!? In the Temple of H'esper the team have met a man who is very interested in their shadowy weapons! The gang meet up in a dingy tavern and complete a load of errands in Kallie's Rest! Lucius, Quill and Nova are getting interested in the lowland sport: Spell Clash! The team make the most out of Kallie's Rest and finally get some long sought after answers! The party have some time to find out what Kallie's Rest has to offer! On the long road to Kallie's Rest the party are beset by two Guardians being chased by a Wyvern! The party have some time to reflect and discover Nightfrost is more than a simple bow! 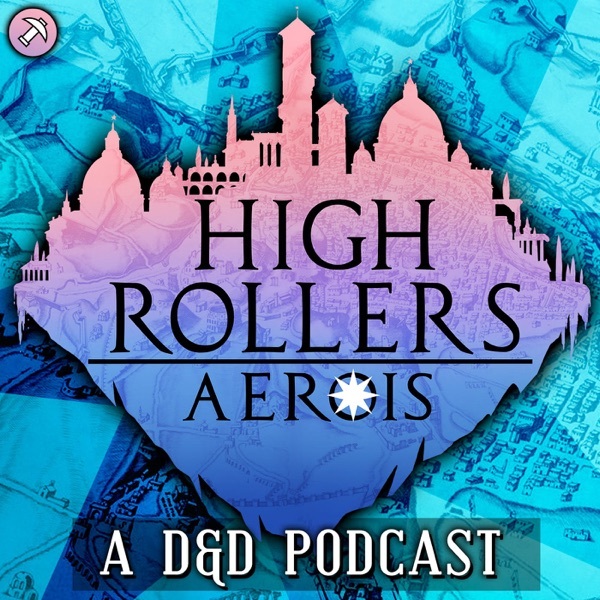 Welcome to the High Rollers 2018 Rollback, a celebration of everything we've done in the last year including Lightfall, Rogue's Gambit and Aerois! Spoilers ahead! Jason Statham wants a Big Vacation, but it's up to us to make sure it doesn't go south! Four bears have calculated the greatest heist of all time! Will it go to plan? Does anything the High Rollers do go to plan? High Rollers: Rogue's Gambit #11 | The Finale! The party have made a powerful ally, but Jarlaxle has some alternate plans! It's the final episode of A Rogue's Gambit! Check out Idle Champions here - https://bit.ly/2MJSdYy - to earn us those valuable D6s... we need all the help we can get. All you need to do is play the game! Ho ho ho! Welcome to the first Aerois Christmas Special with special guest: Matt Mercer! A bunch of goons led by a man with a german accent have raided the party, will the party escape and live free, or die hard?! This episode was filmed live as part of the Yogscast Jingle Jam 2018, a month long event of streams and fund raising for hundreds of charities! Head to https://bit.ly/2AHOj9I to get over $750 worth of games for just $35 and raise some money for charity! A massive thank you to Matt Mercer for joining us on this special episode! The team make a new friend and get their invitations to a festive St Mira's Day party! The party continue their battle with the gunslinger in the Remnant ship! A dangerous gunslinger blocks the path to a powerful bow, but first we catch up with Aila, Arval and Valla! The team meet an old "friend" and Bertie reveals a pretty big secret! In the town of Ironwick, Quill has discovered some ritualistic activity in the general store! The gang try to find the Old Windmill, and make a valuable friend along the way! D&D Beyond is the official digital toolset for Dungeons & Dragons 5th Edition. Use the code HIGHROLLING on D&D Beyond (http://bit.ly/dndbeyondhighrollers) to get 25% off all digital items (excluding the Legendary Bundle)! The team lick their wounds and head down the Golden Road! The team is split! Aqua Mamba and Fleur team up to break Bertie and Boomer out of Jarlaxle's trap! One of the team has fallen, can the party survive this gruelling encounter?! The party of five head deeper into the ruins and find more than ghosts in this evil place! High Rollers LIVE at MCM Comicon! Thanks to everyone who came to see us! Buckle up, rev your engines, it's time for the Swift and the Sorcerous! The team continue their adventure in the ISTAR facility and head towards the Eye Catcher! We're trying to defuse a situation with a Pixie and begin exploring the elven ruins! World Anvil gives you the tools to make fantastic new worlds with the ability to generate interactive maps, timelines, character sheets, stat blocks and more! Create your FREE account at www.worldanvil.com now and start building your universe! The party begin a new chapter and head towards an elven keep that should answer a whole lot of questions! In the upper levels of the dark asylum the party find the source of all this madness! Critit.co.uk combine carpentry and RPG gaming to deliver bespoke, handcrafted gaming accessories for D&D and Pathfinder players! Dice Boxes, Rolling Trays, DM Screens and more! Make sure you check out their kickstarter - bit.ly/critithighrollers - to get 25 beautiful Animal Companion miniatures for £40! Support them there and get yourself some furry, scaly or slimy friends for your campaign! The party have entered the Asylum and continue their investigations into the disappearances! The League of Ordinary Gentlefolk have made their way into the asylum and start investigating the disappearances! Kim is running a spooky one-shot in a terrifying Asylum! A new cast of characters must investigate the disappearances within! Thanks to Idle Champions of the Forgotten Realms and Dungeons and Dragons for sponsoring this series! More information below! In order to gain the help from the Silverhand the party must complete a small quest in Acquisition Incorporated's ISTAR Facility! We're surrounded by a mob who are lead by Rosehall's most corrupt businessman, and he has some very serious demands! Brilliant.org helps you master concepts through fun, guided problem solving. D&D has a rich history of puzzles and problems, so boost your brain power with Brilliant! The first 200 users to follow our link (http://bit.ly/highrollersarebrilliant) will get 20% off an annual subscription! Grab some HR merch and more at 10% off here: smarturl.it/HighRollersMerch or use the code HIGHROLLERS on checkout! The party have caught up to the kidnappers and begin their path to justice! Imprisoned, alone, in danger. Can Bertie survive a supermax prison!? We sustained some terrible injuries, will we press forward to save Valla?! Huge thanks to our sponsors D&D Beyond and Brilliant. We've caught up to the shadow-walking goliath, it's time to get revenge! Two have been murdered in the quiet town of Rosehall. The party immediately make preparations to catch the culprit! The team have their invites to a dinner with the Brookstones, but something sinister is unfolding elsewhere in Rosehall! The team gain a mysterious new member as they head towards a fancy dinner party! Mamba's Mercenaries have a meeting with Dandelion but it seems like there are others looking for him as well! Thanks to Wizards of the Coast for making this possible, and thanks to Idle Champions of the Forgotten Realms for sponsoring this series! Valla is ready to share some of her mysterious past and we meet someone we've heard a lot about! With their newfound riches the team seem to be gathering a lot more attention around Rosehall! Welcome, agents, to a new mini-series in Waterdeep! Four Harper agents are assigned to a mission that will test what little skills they have! The darkness of Dwalinden is getting to us, and now something strange is happening to Sentry! We continue our exploration of the mostly dangerous (but mostly unlooted) Dwalinden! Huge thanks to our sponsors D&D Beyond and Brilliant. D&D Beyond is the official digital toolset for Dungeons & Dragons 5th Edition. Use the code HIGHROLLING on D&D Beyond (http://bit.ly/dndbeyondhighrollers) to get 25% off all digital items (excluding the Legendary Bundle)! In the dark, dark chasm we find a dark, dark house with some dark, dark loot! Let's jump into an unexplored and dangerous chasm, they said. It'd be fun, they said. With a mission in mind the team explore more of the town to meet the locals! Huge thanks to our sponsors D&D Beyond and Brilliant. D&D Beyond is the official digital toolset for Dungeons & Dragons 5th Edition. Use the code HIGHROLLING on D&D Beyond (http://bit.ly/dndbeyondhighrollers) to get 25% off all digital items (excluding the Legendary Bundle)! The party continue their journey down the Whitebreeze River towards, hopefully, civilisation! The gang make plans to finally leave the Bitterwood and find some semblance of civilisation! Things are looking dire for us as we continue the fight against the Wild Elves! Plans are in place for the midnight raid! It's time to get back what was stolen from us! The party meet more Wild Elves, but these ones want more than gold! Wolves, Fire and Bears, oh my! The party investigate the crashed Sparrowblade! Stranded in a dangerous land the party have to overcome Wild Elves and more to survive! Sky pirates have attacked the Sparrowblade and send it hurtling towards the ground! The party look for some way to survive but face a large mechanical threat in the cargo hold! Welcome to Aerois! A brand new campaign in a brand new world with brand new characters! The party are travelling to the Sky City of Gusthaven on an airship, the Sparrowblade. However, their journey quickly takes a complicated turn as they are awoken in the night by a thunderstorm and the sound of battle!